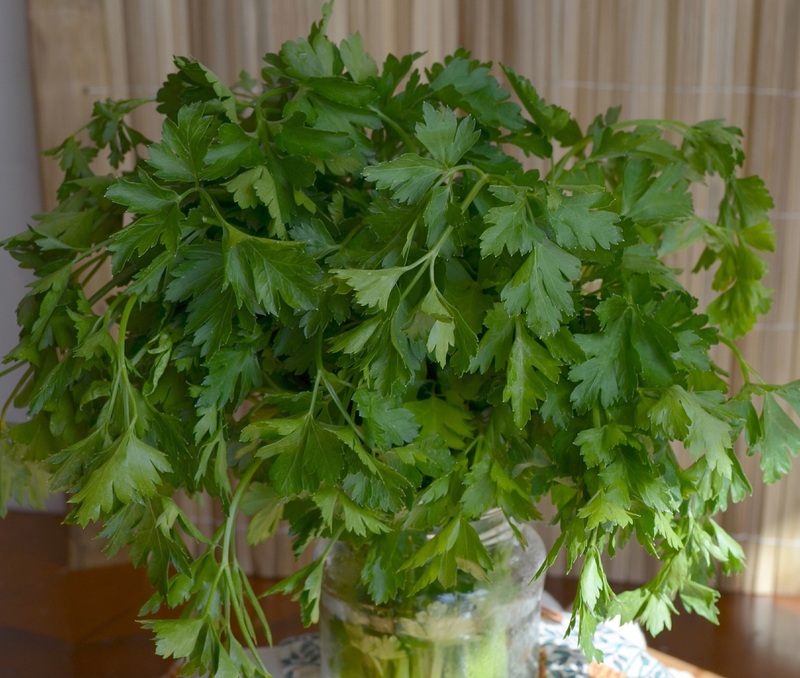 There was, once upon a time, a woman named Pascadozzia, and one day, when she was standing at her window, which looked into the garden of an ogress, she saw such a fine bed of parsley that she almost fainted away with desire for some . . . I can only imagine looking through that window . . .
Late at night, when when the world lies sleeping and Eve is wide awake, I curl up next to her and tell her the tale of Parsley and the Ogress. It fascinates her because it reminds her of the story of Rapunzel. And it's one of my favourites because it radiates with an affinity and desire for simple, peasant food (a bed of parsley) unique to a culture that is very dear to my heart. Panzanella is an Italian salad made with dry bread, juicy tomatoes and yes, parsley. It's peasant food at its best, and being such it's rustic and hearty and utterly delicious. This is a favourite weeknight meal in our house. I can rely on it when the day goes by too quickly and I haven't had time to think about dinner, let alone prepare it. With the end of the school year this week, our days have been flying by all too often, and this salad has been my saving grace. The ingredients are staples in my kitchen; I know they're always in my pantry. Cannellini beans, capers, bread, oil, vinegar, and fresh parsley from the garden. 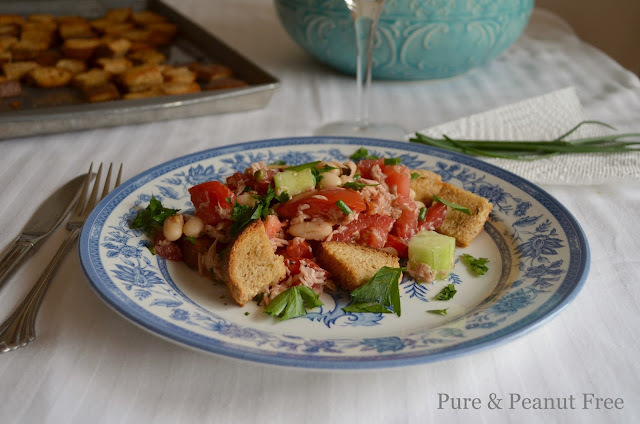 Traditional panzanella is made with stale bread that's been resurrected by soaking in water. The bread is then crushed with tomatoes and fresh herbs. I like to add cucumbers to mine, and tuna and cannellini beans for protein. Instead of soaking the bread, I season homemade croutons with herbes de provence and add them to the salad at the last minute to soak up all the glorious tomato juice. It's dressed simply in a white wine vinaigrette and lots of fresh herbs. Hungry for more bread salad? 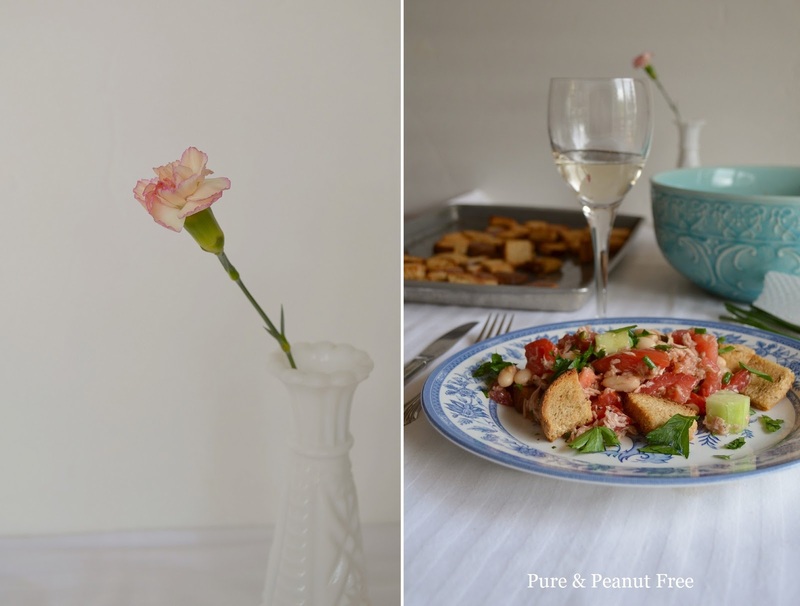 Here's my Tomato and Mozzarella Panzanella - another favourite! Read the whole story of Parsley and the Ogress here. Preheat your oven to 400 F (200 C). Spread the bread cubes on a large sheet pan. Drizzle with enough olive oil to lightly coat each piece (1-2 Tbsp). Season with herbes de provence and a pinch of salt and pepper. Bake for 10 minutes, turning the bread half way through baking. Watch carefully as they burn quickly. Meanwhile, whisk the extra virgin olive oil and vinegar in a large serving bowl. Add the tomatoes, cucumber, tuna, beans, capers and salt and pepper to taste. Toss well. Top with the herbs. When ready to serve, toss the bread with the salad. Serve immediately. The recipe is actually wonderful. It's very tasty and healthy too. I was trying to find such wholesome and tasty recipes. Your blog is in reality very good and it has many healthful foods which have been very smooth to make. thanks a lot for this submit. I love to refer your blog to get some exceptional precise, tasty and wholesome recipes.